Olympic fever has taken hold again; the almost irresistible pull has me hooked on all sorts of sports that I would never usually watch and it has been great fun. Every four years I get drawn in, and though the time difference is playing havoc with my sleep, it is certainly worth it so far and Team GB are making us so proud yet again. What I love about the Olympics is how sportspeople from a wide variety of backgrounds have their chance in the limelight for a few days every four years. But what really fascinates me is the back story. It’s the certain knowledge that, aside from a few high-profile names, the vast majority of Olympians spend nearly every day of the year training, without the adulation of the crowds or the world’s media; getting up early, travelling to meets in the back of beyond with little prospect of prize money or recognition. It’s the single-mindedness and dedication that I admire so much. The level of preparation that goes into that one race, one shot, one routine or one dive is off the scale. And people who haven’t done it can never really understand. It’s not dissimilar for a chef. It is the same formula which states that the level of preparation you put in is directly proportional to the success of the finished product. Which you always hope will be a triumph, of course! August is generally a quiet month for me by choice, but this year I made an exception to cater a lavish party to celebrate the 60th birthday of our dear family friend Fiona Foley-Croft. 4 courses for 30 guests with the added complication that I was also a guest at the party. So more than ever the preparation was crucial as I would be handing over to another chef to finish the dishes and ensure everything was served as perfectly as I would want it to be. For me it comes down to lists. I have always been a bit of a list queen: a daily to-do list, shopping lists, packing lists for holidays and the like. My sister Molly has always teased me about my list addiction and so it seems I have now found the perfect career to satisfy my predilection for itemising. Because when it comes to cooking there are always lots of lists. And the most important of all is the prep list. In restaurants this is sometimes called the MEP or ‘mise-en-place’ list and it deals every little thing that has to happen ensure the food is cooked and gets to the table on time. It does not say for example, “cook dhal” or “roast lamb”. Each dish is broken down into its component parts, so it would say, “wash lentils; slice onions, garlic, chillies; boil lentils and add spices; fry onions and garlic; garnish and serve”. For a chance to re-create a simplified version of the birthday dinner I created for Fiona, featuring a 3-hour Scotch Bonnet roast lamb shoulder, tandoori tiger prawns, baba ghanoush, salads, raitha and naan bread finished with a delicious Eastern Mess dessert, simply follow the steps below. Marinade prawns in tandoori style marinade (turmeric, chilli powder, paprika, ginger paste, lemon juice, salt and natural yoghurt). Cover and leave in fridge until required. Roast aubergines for baba ghanoush – 1 hour at 190ºC. Make rosewater berry sauce for Eastern Mess (berries, icing sugar cornflour, rosewater) and pass through a sieve to remove seeds. Store in a squeezy bottle or pouring jug and allow to cool to room temperature. Chop or break up meringues for Mess and keep in a food bag until required. Whip Chantilly cream for Mess. Decant into piping bag or a bowl, cover and place in fridge until required. Wash, prep and slice berries – cover and leave at room temperature. Remove aubergine flesh from skins, roughly chop and add to a bowl. Finely dice red onion, garlic, chilli, and chop fresh coriander. Season with sea salt and freshly squeezed lemon to make baba ghanoush. Cover with cling film and chill. Whiz 1 bunch coriander, 1 peeled garlic clove, 1 hot green chilli, pinch of sea salt, 1 tsp sugar in a blender. Add natural yoghurt to make raitha. Pour into serving bowl, cover with cling film and chill in fridge. Prep items for green salad (iceberg lettuce, cucumber, celery, spring onions) and arrange in a service bowl. Finely slice red onion and add to sliced tomatoes and washed rocket leaves. Dress with sea salt, lemon juice and cold-pressed rapeseed or olive oil. Remove lamb shoulders from BBQ / oven and wrap tightly in foil and allow to rest for 30 minutes. Pour glass of wine for self and enjoy the party! In a tribute to all our Olympians, my Eastern Mess recipe is given below. This is a recipe I have lovingly borrowed from my favourite Persian chef, Sabrina Ghayour, from her debut cookbook Persiana, published by Mitchell Beazley. I garnished them with golden sugar nibs to add the appropriate level of bling befitting an Olympic week. These are available from Waitrose – Cook’s Ingredients Bronze Sugar Nibs – but I think they look more like gold! I hope you enjoy the rest of the Games and that my recipes can help you plan a hassle-free summer menu to enjoy with friends and family. First make the rosewater berry sauce. Take 250g of the mixed berries and place into a small saucepan with 2 tbsp of the icing sugar and 2 tsp cornflour. Heat gently with some water, no more than 50 ml. You can use frozen berries for the sauce, but leave out the water. Gently simmer the berries for 15 minutes until they are completely soft. Taste the sauce and add more icing sugar if you like it sweeter. Pass the sauce through a sieve until you have a smooth sauce and set aside to cool. Once cooled, add 1 tsp of rosewater and taste. Only add the second teaspoon if you like the favour and want to make it stronger. Whip the double cream with the remaining 2 tbsp icing sugar and vanilla extract until holding its shape in soft peaks. Prepare the remaining berries and get ready to construct the dessert. Use a pretty glass bowl or glasses for maximum effect. Break or chop the meringues into bite-sized pieces. 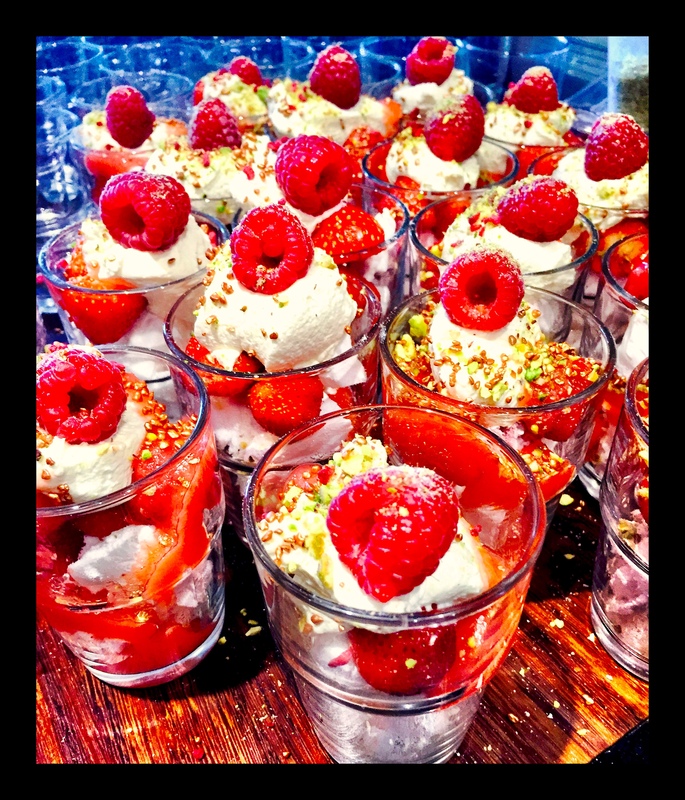 Start with meringue in the bottom of the glass, then add the fresh berries, whipped cream on top and a good drizzle of the rosewater berry sauce. Top the desserts with something crunchy, gold sugar nibs are a particular favourite for me, but you can use toasted nuts or oats or even crystallised rose petals if you can find them. I have been thinking a lot about my forthcoming holiday lately and thinking I should probably go on a bit of a health kick in advance of the excesses that will no doubt ensue when I am surrounded by the culinary delights that Provence has to offer. In theory it should be easier to eat healthily during the summer months, but in practice I find this is rarely true. But there is no doubt that the availability of fresh produce and the warmer temperatures make a good environment for some lighter meals, so I wanted to focus on a healthy theme for this blog. I had the perfect excuse to get creative with salads over the weekend as I was invited to a BBQ hosted by one of our neighbours for the residents of ‘our road’. We have these neighbourly events fairly regularly and it is great to get to know some of our neighbours a bit better. Some people (yes, I mean you Jim) will maintain that BBQs are all about the meat, but I would have to disagree. The meat for me is merely an excuse, a foil if you will, for the vast array of salads which I feel should be present at this sort of al-fresco dining event. There always has to be a green salad of mixed leaves; this is the staple salad of any BBQ spread. My top tip for lettuce is to always serve it dry, if it is wet then the dressing will never cling to the leaves. If you don’t have a salad spinner to dry your lettuce after washing, I would recommend investing in one. I always make a tomato salad separately because I love the juicy sweetness of tomatoes in the height of their season and they don’t always stand up well when mixed with other crunchy vegetables. My salad is adapted from a Ree Drummond recipe (my favourite cowgirl cook) in which the tomatoes are marinated for an hour or two at room temperature with very finely sliced spring onions and lots of fresh basil and/or parsley in a dressing made from extra virgin olive oil, balsamic vinegar, light brown sugar and seasoning. This is an amazing combination and the dressing is particularly good for being mopped up with crusty white bread at the end of the meal. My top tip for tomatoes is never to store them in the fridge. They taste so much better at room temperature; their natural sweetness will come through much more. Try mixing up the types of tomatoes in your salad; different colours and sizes or even heritage tomatoes if you can find them, make the visual impact much greater and the flavours better too. Another beautiful salad is one that my Canadian friend Christine makes. She tells me it is originally a recipe by Rick Stein from one of his European odysseys, but I’ve always considered it to be hers! This salad combines canteloupe melon, cucumber, tomato, crumbly goats cheese and fresh mint leaves and is finished with a dressing made from olive oil, red wine vinegar, caster sugar and salt and pepper. The combination of sweet melon and salty goats cheese, seasoned with lots of freshly ground black pepper is a complete revelation and delicious on its own for a light lunch. And the third salad I made uses one of my favourite summer ingredients, peaches. For me peaches and nectarines, which work equally well in this salad, are the taste of summer. They remind me of European holidays as a child, where I was amazed by the intense flavour and juiciness of these stone fruits when eaten in Greece or Spain on a hot sunny day. Although the flavours of peaches bought in this country is not always so good, in this recipe they are grilled and peeled which increases the intensity of the flavour. 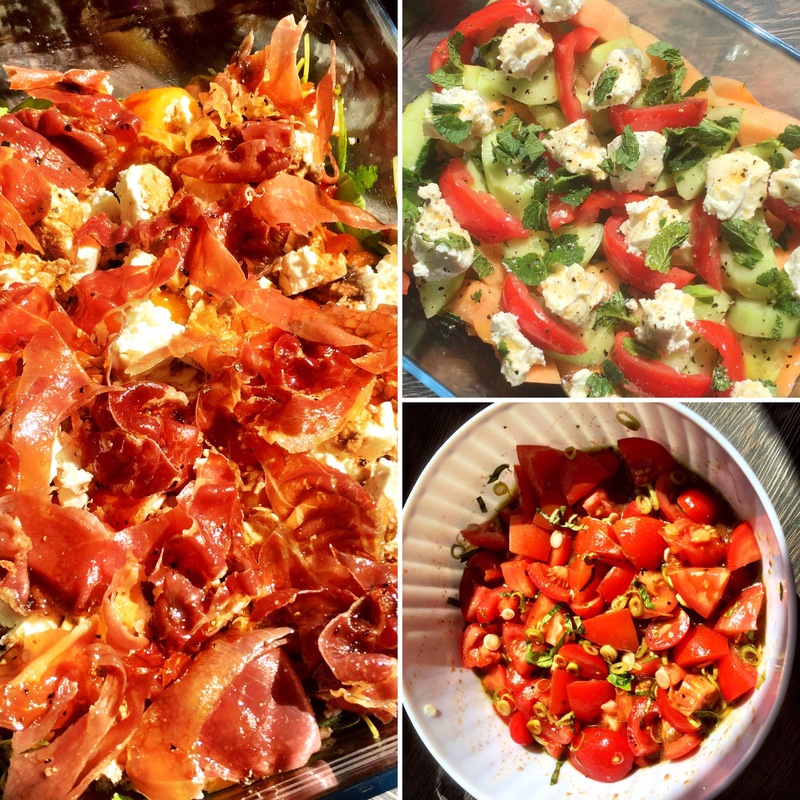 Mixed with rocket, feta cheese and crispy prosciutto or Parma ham in a balsamic vinaigrette this was the biggest hit with my neighbours on the day! So here are the recipes – I hope you enjoy making them too. Cut the tomatoes and arrange in a shallow bowl. Slice the spring onions very finely and scatter on top. In a screw top jar, add all the dressing ingredients and shake together until well combined. Pour the dressing over the tomatoes and leave to marinate for 1-2 hours at room temperature before enjoying. Slice the melon, cucumber and tomatoes and arrange on a serving platter. Crumble the goat’s cheese on top then scatter over the torn mint leaves. Whisk together the dressing ingredients until well combined then drizzle all over the salad. Season with some more freshly ground black pepper then enjoy. Whisk together the dressing ingredients and season well with salt & pepper. Grill the prosciutto under a hot grill until crisp and remove to a plate to cool. Cut the peaches into quarters and remove the stones, then place under the hot grill, skin-side up for 3-4 minutes until the skins blacken. Take the peaches out and remove the skins with a paring knife. They should come off very easily. In a serving bowl, place the rocket leaves and toss with half of the dressing. Arrange the peach slices, scatter over the feta cheese and then chop the crispy ham into thin slices and scatter over the top. Drizzle with the remaining dressing and serve.